Hydrogel scaffolds that mimic the native extracellular matrix (ECM) environment play a crucial role in tissue engineering and they are ubiquitously in our lives, including in contact lenses, diapers and the human body. Researchers at Rutgers have invented a printing method for a smart gel that can be used to create materials for transporting small molecules like drugs to human organs. The approach includes printing a 3D object with a hydrogel that changes shape over time when temperature changes. The potential of the smart hydrogels could be to create a new are of soft robotics and enable new applications in flexible sensors and actuators, biomedical devices and platforms or scaffolds for cells to grow. Rutgers engineers operated with a hydrogel that has been in use for decades in devices that generate motion and biomedical applications such as scaffolds for cells to grow on. The engineers learned how to precisely control hydrogel growth and shrinkage. In temperatures below 32 degrees Celsius, the hydrogel absorbs more water and swells in size. When temperatures exceed 32 degrees Celsius, the hydrogel begins to expel water and shrinks, the study showed. According to the Rutgers engineers, the objects they can produce with the hydrogel range from the width of a human hair to several millimeters long. The engineers also showed that they can grow one area of a 3D-printed object by changing temperatures. To develop new tissues, researchers at the Medical Research Council Center for Regenerative Medicine at the University of Edinburgh have found that stem cells transformed into 3-D liver tissue can support liver function when implanted into the mice suffering with a liver disease. The scientists stimulated human embryonic stem cells and induced pluripotent stem cells to mature pluripotent stem cells into liver cells, hepatocytes. Hepatocytes are the chief functional cells of the liver and perform an astonishing number of metabolic, endocrine and secretory functions. Hepatocytes are exceptionally active in synthesis of protein and lipids for export. The cells are grown in 3-D conditions as small spheres for over a year. However, keeping the stem cells as liver cells for a long time is very difficult, because the viability of hepatocytes decreases in-vitro conditions. Succeeding the discovery, the team up with materials chemists and engineers to detect appropriate polymers that have already been approved for human use that can be developed into 3-D scaffolds. The best material to use a biodegradable polyester, called polycaprolactone (PCL).PCL is degraded by hydrolysis of its ester linkages in physiological conditions (such as in the human body) and it is especially interesting for the preparation of long term implantable devices, owing to its degradation which is even slower than that of polylactide. They spun the PCL into microscopic fibers that formed a scaffold one centimeter square and a few millimeters thick. At the same time, hepatocytes derived from embryonic cells had been grown in culture for 20 days and were then loaded onto the scaffolds and implanted under the skin of mice.Blood vessels successfully grew on the scaffolds with the mice having human liver proteins in their blood, demonstrating that the tissue had successfully integrated with the circulatory system. The scaffolds were not rejected by the animals’ immune systems. 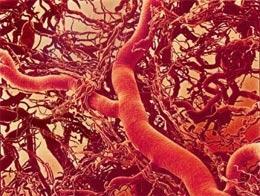 The scientists tested the liver tissue scaffolds in mice with tyrosinaemia,a potentially fatal genetic disorder where the enzymes in the liver that break down the amino acid tyrosine are defective, resulting in the accumulation of toxic metabolic products. The implanted liver tissue aided the mice with tyrosinaemia to break down tyrosine and the mice finally lost less weight, had less buildup of toxins in the blood and exhibited fewer signs of liver damage than the control group that received empty scaffolds. According to Rob Buckle, PhD, Chief Science Officer at the MRC, “Showing that such stem cell-derived tissue is able to reproduce aspects of liver function in the lab also offers real potential to improve the testing of new drugs where more accurate models of human tissue are needed”. It is believed that the discovery could be the next step towards harnessing stem cell reprogramming technologies to provide renewable supplies of liver tissue products for transplantation. Cells within our bodies change over time and divide, with thousands of chemical reactions happening within cell daily. Nicholas Melosh, Associate Professor of Materials Science and Engineering, developed a new, non-destructive system for sampling cells with nanoscale straws which could help uncover mysteries about how cells function. Currently, cells are sampled via lysing which ruptures the cell membrane which means that it can’t ever be sampled again. The sample system that Dr. Melosh invented banks on, on tiny tubes 600 times smaller than a strand of hair that allow researchers to sample a single cell at a time. The nanostraws penetrate a cell’s outer membrane, without damaging it, and draw out proteins and genetic material from the cell’s salty interior. The Nanostraw sampling technique, according to Melosh, will knowingly impact our understanding of cell development and could result to much safer and operational medical therapies because the technique allows for long term, non-destructive monitoring. The sampling technique could also inform cancer treatments and answer questions about why some cancer cells are resistant to chemotherapy while others are not. The sampling platform on which the nanostraws are grown is tiny, similar to the size of a gumball. It’s called the Nanostraw Extraction (NEX) sampling system, and it was designed to mimic biology itself. The goal of developing this technology was to make an impact in medical biology by providing a platform that any lab could build. 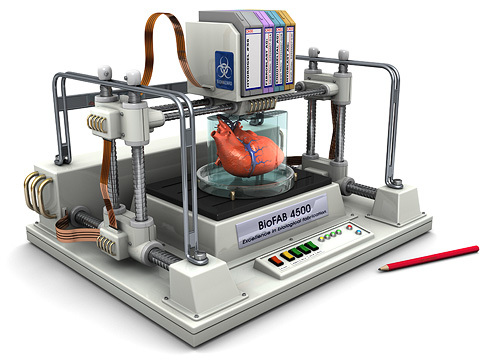 Although first originated in 2003, the world of bioprinting is still very new and ambiguous. Nevertheless, as the need for organ donation continues to increase worldwide, and organ and tissue shortages prevail, a handful of scientists have started utilizing this cutting-edge science and technology for various areas of regenerative medicine to possibly fill that organ-shortage void. Among these scientists is Ibrahim Tarik Ozbolat, an associate professor of Engineering Science and Mechanics Department and the Huck Institutes of the Life Sciences at Penn State University, who’s been studying bioprinting and tissue engineering for years. While Ozbolat is not the first to originate 3D bioprinting research, he’s the first one at Penn State University to spearhead the studies at Ozbolat Lab, Leading Bioprinting Research. 3D bioprinting is the process of creating cell patterns in a confined space using 3D-printing technologies, where cell function and viability are preserved within the printed construct. Recent progress has allowed 3D printing of biocompatible materials, cells and supporting components into complex 3D functional living tissues. The technology is being applied to regenerative medicine to address the need for tissues and organs suitable for transplantation. Compared with non-biological printing, 3D bioprinting involves additional complexities, such as the choice of materials, cell types, growth and differentiation factors, and technical challenges related to the sensitivities of living cells and the construction of tissues. Addressing these complexities requires the integration of technologies from the fields of engineering, biomaterials science, cell biology, physics and medicine, according to nature.com. Additive manufacturing, otherwise known as three-dimensional (3D) printing, is driving major innovations in many areas, such as engineering, manufacturing, art, education and medicine. Recent advances have enabled 3D printing of biocompatible materials, cells and supporting components into complex 3D functional living tissues. 3D bioprinting is being applied to regenerative medicine to address the need for tissues and organs suitable for transplantation. Compared with non-biological printing, 3D bioprinting involves additional complexities, such as the choice of materials, cell types, growth and differentiation factors, and technical challenges related to the sensitivities of living cells and the construction of tissues. Addressing these complexities requires the integration of technologies from the fields of engineering, biomaterials science, cell biology, physics and medicine. 3D bioprinting has already been used for the generation and transplantation of several tissues, including multilayered skin, bone, vascular grafts, tracheal splints, heart tissue and cartilaginous structures. Other applications include developing high-throughput 3D-bioprinted tissue models for research, drug discovery and toxicology. Organovo anticipates that its first artificial human organ will be a kidney. This is because, in functional terms, kidneys are one of the more straight-forward parts of the body. The first bioprinted kidney may in fact not even need to look just like its natural counterpart or duplicate all of its features. Rather, it will simply have to be capable of cleaning waste products from the blood. You can read more about the work of Organovoand Professor Forgac’s in this article from Nature. In another experient, Mao’s team implanted bioprinted scaffolds in the place of the hip bones of several rabbits. Again these were infused with growth factors. As reported inThe Lancet, over a four month period the rabbits all grew new and fully-functional joints around the mesh. Some even began to walk and otherwise place weight on their new joints only a few weeks after surgery. Sometime next decade, human patients may therefore be fitted with bioprinted scaffolds that will trigger the grown of replacement hip and other bones. In a similar development, a team from Washington State University have also recently reported on four years of work using 3D printers to create a bone-like material that may in the future be used to repair injuries to human bones. New work moves closer to the age of organs on demand.